VOHC(r) Seal of acceptance for plaque control in dogs. Tastes like water to dogs! Turns water a pleasant apple green color. 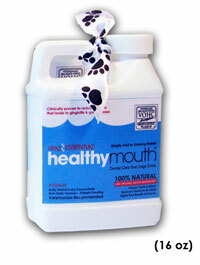 Add to your dog's drinking water each time bowl is refilled. 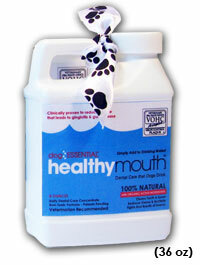 Benefits achieved by the continual, daily consumption - we understand that dogs all drink different amounts. Airtight packets ensure ingredients retain potency. Un-opened and opened jugs good for 24 months. 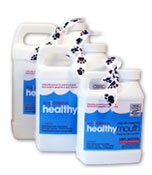 Large Breeds /Multi-Pet Households or Small Breeds (will last until next year's dental cleaning for a small breed). Formula is good for 24 months. 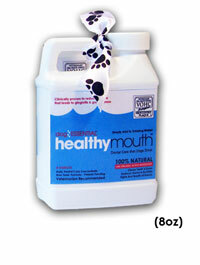 Healthymouth LLC will unconditionally refund your payment if your dog will not consume.